"Hey Mr. T, why is the I3- ion a linear shape?" "Hey Mr. T, why are H2O, NH3 and CH4 all sp3 hybridization even though their molecular geometries are different?" These two previous conversations have been pretty common within my IB Chemistry course every time we study chemical bonding and molecular geometry - or review before IB exams each spring. But last year's equipment order in June included two new items to use in my classroom that have gotten quite a bit of use lately. 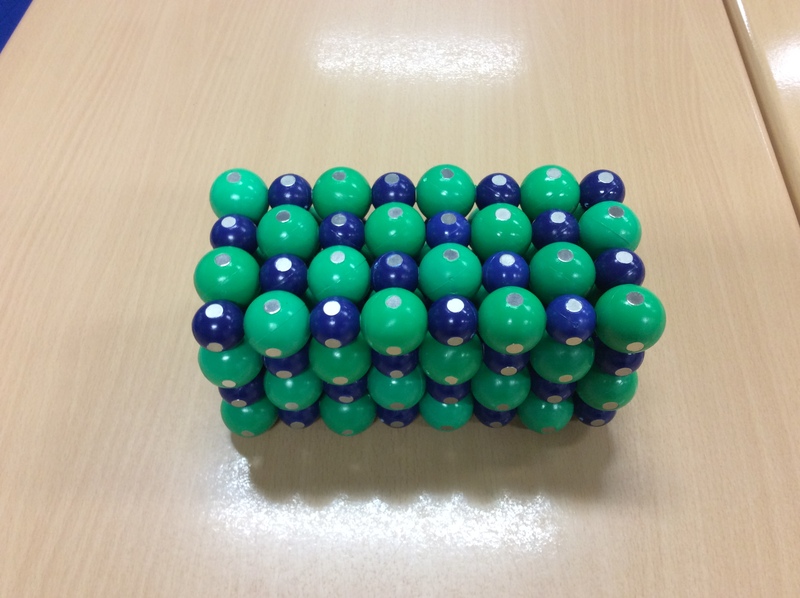 One new item is a model of the crystal lattice of a salt crystal from 3-D Molecular Designs, using magnets to hold the ions together. I often use this for comparing the structure of the ionic compound to my big beaker of water molecules. I frequently joke with my kids about being thirsty and grabbing my water molecules, but it serves a few distinct purposes. 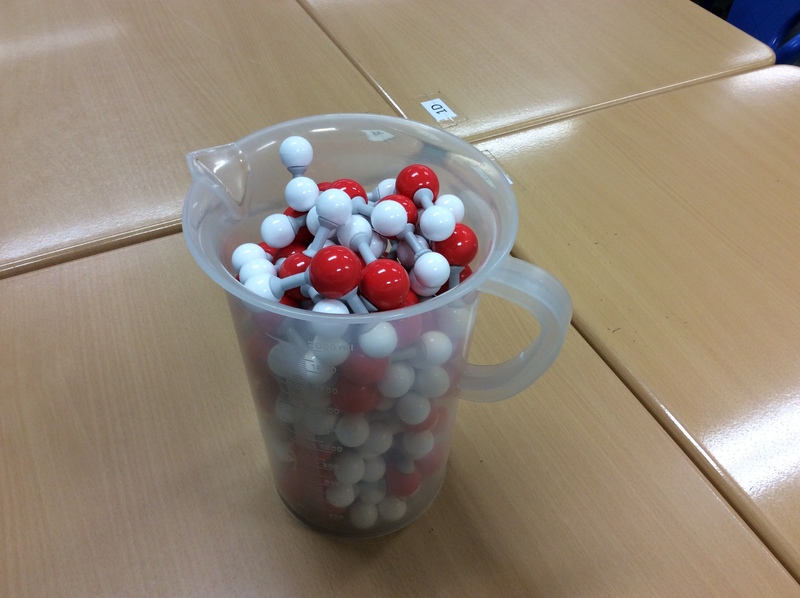 The obvious aim of this beaker is to show students the idea of particles in a molecular compound versus how the particles (ions) arrange in an ionic compound. But even more than that, I often emphasize that my beaker is full of a chemical! It's a bit of an attempt to reduce chemophobia in some small manner. Another new item is my collection of magnetic water molecules from 3-D Molecular Designs. These models allow me to discuss several concepts with students. First, I can show them hydrogen bonding within a collection of water molecules and the attraction between the partial positive charge of the hydrogen and the partial negative charge of the oxygen. But this kit comes with ethane and ethanol models as well. 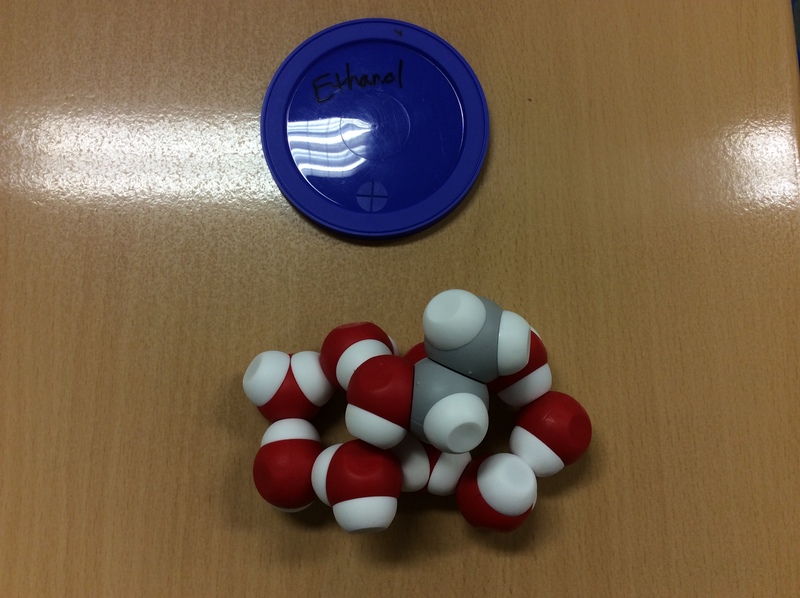 The water molecules will hydrogen bond with the oxygen and hydrogen of ethanol, but have no attraction with the ethane molecule. It's a bit of a simplification, as it ignores London dispersion forces between any two molecules, but I use it to highlight the influence of intermolecular forces on solubility. The water molecules also can be used to show the hydration of ions by using them jointly with the ions from the salt crystal. The hydrogens of water surround the chloride ions, while the oxygens of water surround the sodium ions. 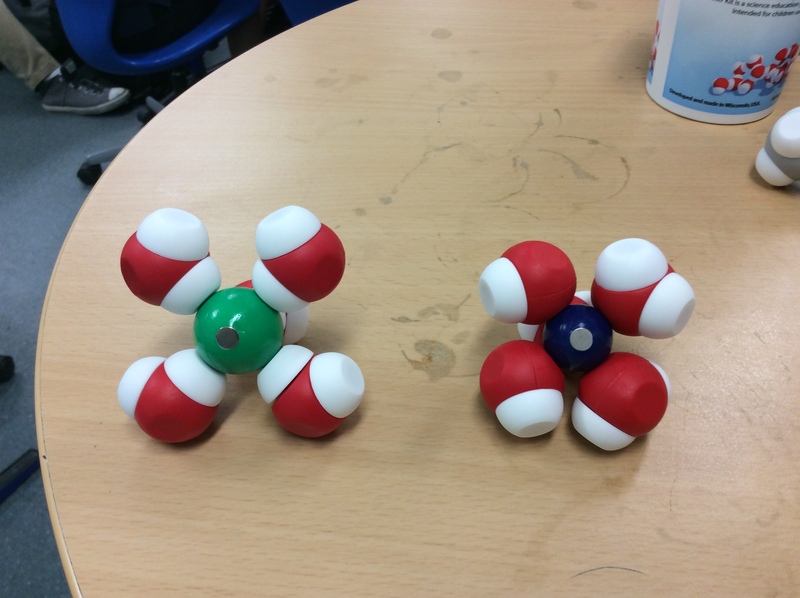 Just this week I have used some combination of these models with seniors in IB Chemistry reviewing hybridization and bonding in organic molecules, juniors in IB Chemistry looking at IMFs of organic molecules (comparing ethane and ethanol in water), and introductory chemistry students as they develop their understanding of polarity. As with any model, these can simplify a concept to make it easier for students to understand. But I also emphasize with my students that these are just models and have limitations as well. I keep my collection of models right near my desk so that any time a question comes up that can be aided by the models, I've got them right there and don't need to go searching. And rarely a week goes by when I don't use them for some discussion. Do you have any fallback models you use with your students? I'd love to hear about them as I look to expand my collection of manipulatives. Love your uses of the models. That lattice salt is awesome. I am sure you will get lots of use out of it. I have been toying with my ping pong balls and hope to get that project going soon. Thanks. The biggest change for me this year is simply keeping the models on the counter right behind my desk - so that every time a discussion comes up about something model-related I can bring them out and use them in the discussion. I'm very curious about what you have planned for the ping pong balls and can't wait to see and hear how it goes. I do exactly the same thing. I have magnetic model kits behind my desk that I constantly use to demonstrate bond energy, intermolecular forces, stoichiometry, etc. I like Doug's idea of the ping pong balls, but I converted an old ball-and-stick model kit into a magnetic model kit. Thanks for the response. Can you give me a more specific description of how you use models to demonstrate bond energy? Thanks for that suggestion. The IB curriculum currently only has addition polymers from alkenes but your suggestion would work for that type of polymer also. I like the idea of having students construct their knowledge of something new from what they are already familiar with. I love the magnetic water kits also, and use them to show how water expands when forming ice, and why solid water has a lower density than liquid water. You can form some nice hexagons and show the larger space ice takes up. "What is there?" Is a great question. Thanks for the response. 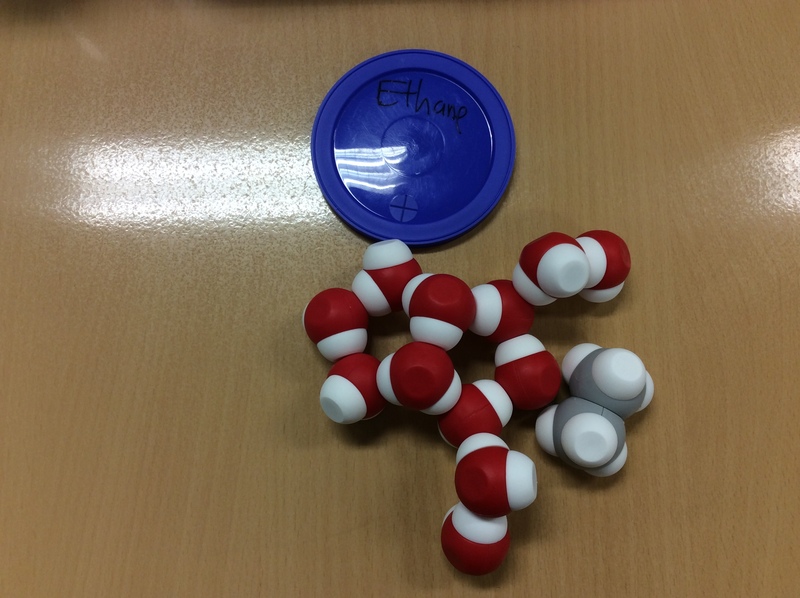 I've not yet made the comparison between liquid water and frozen water using these models. I'll have to check it out! Your question about what is inside the "hole" of the hexagon reminds me of a question I asked my juniors just last week. "What is inside a bubble within boiling water?" Quite a few got it right with the idea of water molecules inside the bubble, but a few still had the misconception about air being inside the bubbles. So Monday I'll probably bring out the big beaker of water to talk about that. I like the idea of always asking students questions to push their understanding. "Is that why water is less dense when frozen?" I just wanted to let you know that it happened on Friday! Some students were up by my desk and we were chatting about an issue with a lab design. One of the students in the conversation is ALWAYS playing with my model collection. I just let it happen, as she's really good at replacing the kits fully put back together. Anyway, she put the magnetic water molecules together...as ice. Her peer looked at the model...paused in thought...and said, "Is that why water is less dense when it is frozen?" while pointing to the emptiness in the model. Recognizing that these models aren't perfect, I was thrilled to have a student make that connection un-prompted! It solidified in my thinking (pun intended) that I need to revisit this when I study phase changes in the future.